This base class represents a boundary condition for an elliptic or parabolic partial differential equation. Base class constructor. Called by all subclass constructors. Fill the ghost cells for a single level. Fill the ghost cells for a Hierarchy of levels. 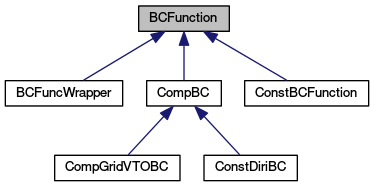 Implemented in BCFuncWrapper, ConstBCFunction, CompBC, ConstDiriBC, and CompGridVTOBC. Computes the values of on ghost cells specifying a data index. By default, this calls the version of the method without a DataIndex. a_index A DataIndex that can be used in the calculation. Reimplemented in CompBC, and CompGridVTOBC. Sets the time associated with this boundary condition. By default, this method does nothing, so this aspect of BCFunction can be ignored for time-independent boundary conditions. a_time The time to be passed to the boundary condition. References LayoutData< T >::dataIterator(), LevelData< T >::disjointBoxLayout(), LayoutIterator::ok(), and DisjointBoxLayout::physDomain().